In the majority Judgment delivered by Justice Peter Obiara, the tribunal set aside the rerun election conducted on September 27, 2018 for being unlawful. Justice Obiora held that the poll conducted in the seven units is unknown by law because INEC has no power to conduct it. The tribunal declared candidate of the Peoples Democratic Party’s (PDP), Ademola Adeleke in the governorship election as the duly elected governor and ordered INEC to immediately issue him with Certificate of Return. The tribunal agreed that PDP and Adeleke established beyond reasonable doubt that INEC did not comply substantially with the Electoral Act in 17 polling units. Consequently, over 2,000 votes credited to the All Progressives Congress (APC) and Governor Oyetola by INEC were deducted from the tribunal, while over 1,000 votes said to have been scored by the PDP and its candidate were also removed from their total votes. The majority judgment held that the returning officer who cancelled the result in the affected units after the announcement had no power to have done so. NAN reports that Prof. Joseph Fuwape, vice chancellor of the University of Technology, Akure was the Returning Officer for the Sept. 22 election Fuwape said the election was inconclusive because 3498 votes were cancelled as a result of ballot box snatching that occurred in some polling units during the election. The affected polling units were Ife North, (one polling unit), Ife south, (two polling units), Orolu,( three polling units) and Osogbo, one polling unit. 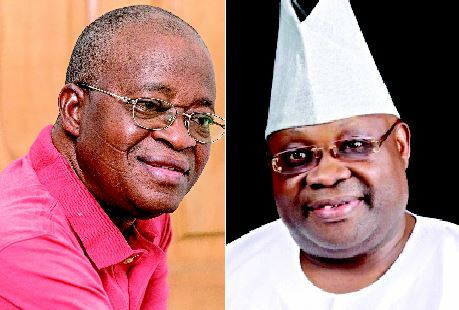 According to Fuwape, Sen. Ademola Adeleke, the candidate of the Peoples Democratic Party (PDP) scored 254,698 votes, while Alhaji Gboyega Oyetola, the candidate of the All Progressives Congress (APC), scored 254, 345 votes. He thus called for rerun elections at the polling units where results were cancelled. The majority judgment after deductions of the votes recorded in the rerun poll gave Adeleke’s score as 253777 and Oyetola’s as 253,476. In the minority judgment, Justice Ibrahim Sirajo, Chairman of the tribunal, held that the petitioners, PDP and Adeleke failed to prove how the non-compliance of non-recording in the columns of accredited votes and account of ballots in the result sheets substantially affected the final results. He further stated that even when non substantial compliance affects the outcome of the election, the tribunal, by virtue of section 140(2) of the Electoral Act, does not have the power to subtract the votes affected by the non-compliance from the scores of the candidates and announce a winner. According to him the tribunal only has the power to nullify the results of the Polling units affected by the noncompliance and order a supplementary poll. He concluded that even if the non-compliance was substantial, it was not proved by the petitioners Earlier, in a ruling on an objection filed against the petition by APC, Oyetola and INEC, the tribunal held that the objection was misconceived and that the tribunal has jurisdiction to entertain the suit. The objection was consequently dismissed by the tribunal.